Imagine everything you ever wanted in a hunting arrow that would boost your performance and give you the most successful archery hunting season? You need not be on the big screen to whip up that perfect shot like the Green Arrow or any fictional characters that have the most notable archery skills to destroy the bad guys. All you need is a set of the best hunting arrows and all you’ll see a world of difference in your performance up front. So what exactly do you need to look for in a hunting arrow in order to improve your archery skills big time? 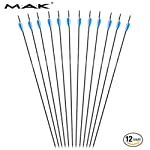 4.0.1 Our Top Choice for Cost: Archery Hunting Arrows 12 Pieces by M.A.K. Archery Hunting Arrows 12 Pieces by M.A.K. Let’s take a look at each of the 3 selected models in our list and scrutinize each one based on the most important criteria for an excellent and high-quality hunting arrow that’s the best deal for your money. Archery Hunting Arrows 12 Pieces by M.A.K. The arrow is made from pure carbon materials with a 0.236-inch diameter and 28 inches length dimensions. The well-made and solid construction of the hunting arrow makes it a great pick to use for the compound, recurve, and long bows. It comes with stainless steel nickel plated tips for less wind drift. Buff Tuff Pile Driver Carbon Arrows by Carbon Express. Unlike the much sleeker Archery Hunting Arrows 12 Pieces by M.A.K., this unit has a 0.308-inch diameter and 0.345-inch Spine. You’ll love the Bulldog Nock Collars and the 2-inch assault vanes that are also not featured in the first model in our selection. Do you want something to boost your accuracy? The Built-In Weight Forward technology that is integrated into the carbon arrow construction offers superior downrange precision. Maxima RED Fletched Arrows by Carbon Express. Since this model is from the same manufacturer, Carbon Express, it also shows some similar features with that of the Buff Tuff Pile Driver Carbon Arrows including the Bulldog Nock Collars and the LAUNCHPAD Precision Nocks. The unit has a similar carbon material construction as that of the M.A.K Archery Hunting Arrows. What makes it different is the dynamic spine with better broadheads for better flight and consistent shots. You may have your own shooting style when it comes to archery hunting but the best arrows depend on your preferences for weight and the weight basically affects the arrow speed. Heavy arrows penetrate better but have decelerated speed while lightweight ones quickly hit the target but lack penetration. Maxima RED Fletched Arrows by Carbon Express. The item specifications include 9.07 GPI, 0.342-inch Spine, and 0.300 inches in diameter. It is a relatively heavy arrow made from carbon materials that are best known for their flexibility and better performance against wind drifts. Archery Hunting Arrows 12 Pieces by M.A.K. With a much higher 10 grain GPI and 1-inch Spine compared to the Maxima RED Fletched Arrows, this carbon arrow model also boasts of its sleeker 0.236-inch diameter with fletching vanes. Buff Tuff Pile Driver Carbon Arrows by Carbon Express. With a higher 11.3-inch GPI compared to the Archery Hunting Arrows 12 Pieces by M.A.K., the model has a slightly bigger diameter than the Maxima RED Fletched Arrows model with its 0.308-inch measurement. This model is basically the heaviest and the slowest in our brood. One of the most important criteria in every buying guide is the affordability and pricing of the item you wish to purchase. Our selection comes in sets of 6 and 12 with different price ranges, depending on the budget of the buyer. Are you amenable to shelling out extra cash for your hunting arrow or do you want something more economical? Always remember that the best pick in terms of the arrow cost is not necessarily the cheapest. You wouldn’t want a cheaper arrow but with the lowest quality at the same time, would you? Check out which of our selection is the best deal for your money. Buff Tuff Pile Driver Carbon Arrows by Carbon Express. The mid-range carbon arrow comes in a pack of 6 with mossy oak brush pattern. With a reasonably priced rate, this hunting arrow is jam-packed with the modern built-in weight forward technology that makes it a great tool for precision and maximum penetration. Maxima RED Fletched Arrows by Carbon Express. Unlike its more affordable counterpart, Buff Tuff Pile Driver Carbon Arrows, this model is the most expensive in our selection. Nevertheless, it offers dynamic spine construction ensuring better speed, flight, and shooting consistency. The blazer vanes and precision nocks are remarkable features that maximize performance, making this 6-pack set worth every dollar you spent. Archery Hunting Arrows 12 Pieces by M.A.K. With the most affordable and lowest price compared to its Maxima RED Fletched Arrows and Buff Tuff Pile Driver Carbon Arrows counterparts, this model is not the least when it comes to quality and performance. It comes with an adjustable design to suit any bow, event for women and children. The stainless steel and nickel plated tips make it the perfect arrow for outdoor and practice shooting while the solid carbon construction offers longer lasting use and performance. 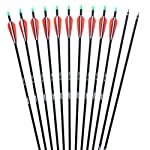 Our Top Choice for Cost: Archery Hunting Arrows 12 Pieces by M.A.K. You can certainly find a wide assortment of hunting arrows in the market. Whether you are a beginner or a veteran in the field of archery or archery hunting, only the best hunting arrows should be in your arsenal collection. A fully equipped hunter with the best arrows on hand delivers optimal performance and results, every time. However, finding an industry-grade, high-quality, and tough hunting arrow is quite a tall order. So what is the best hunting arrow so far? Based on our criteria and the different features of our top 3 hunting arrow selection, we highly recommend Maxima RED Fletched Arrows by Carbon Express. The high rated arrow scored best in terms of Arrow Construction and Weight and Speed, having just the right design and built that guarantees optimal performance, no matter what the terrain and weather condition may be.